An offshoot of the Tohno family. Of all the branch families, their Tohno blood is the thinnest. The father’s name is Fumiomi, the mother’s name is Keiko, and the eldest daughter’s name is Miyako. They took in Shiki when he was nine years old. Their home includes an Ikebana classroom, and something resembling a Kendo dojo. 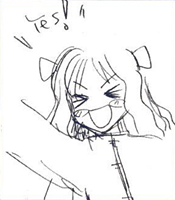 By the way, since Miyako is still in elementary school she’s positively overflowing with youthful energy. 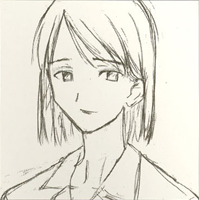 She doesn’t act especially affectionate toward Shiki, but sometimes she’ll tackle him out of nowhere with a beaming smile plastered over her face. …Wait, who wouldn’t consider that being affectionate towards him? They took in Shiki when he was nine years old. Their home includes an Ikebana classroom, and something resembling a Kendo dojo. The picture below is of Keiko.